The Civil War was a difficult time for everyone and the Birdwell family was no exception. The Birdwells are a family of Quakers from Pennsylvania. Eliza (Dorothy McGuire) is a very devout Quaker minister who abhors any type of violence, even if it’s just her youngest son Little Jess (Richard Eyer) having a conflict with her pet goose. The rest of the family isn’t quite as devout as Eliza. Her husband, Jess (Gary Cooper), enjoys things like music, racing his carriage, and is willing to bring the children to the county fair, all things Eliza disapproves of. He even purchases an organ without Eliza’s permission, knowing she won’t be happy about it. Their teenage daughter Mattie (Phyllis Love) has fallen in love with Gard Jordan (Peter Mark Richman), a soldier. And their oldest son Josh (Anthony Perkins) is against the violence of war, but isn’t against playing soldiers with Little Jess and even understands violence may be necessary at times. The family has tried to stay out of the war, but they’re forced to confront the reality of the situation when a Union officer comes to services at their meetinghouse and asks how, given their pacifist beliefs, they plan to deal with the impending threat of Confederate troops moving closer to home. Although some of the Quakers admit to wavering in their pacifist nature, none of them immediately agree to join the Home Guard. Some time later, Gard comes to visit as he is recovering from a gunshot wound and Josh admits he’s considering joining the Army. Just days later, the Confederates are dangerously close to the Birdwell’s home and Josh decides to go off to fight; a decision that makes Eliza feel like he’s turning his back on her. Jess, on the other hand, is more understanding of Josh’s decision, but hesitates to pick up a gun until it is absolutely necessary. When Jess finally leaves the family home with a gun, Confederate soldiers arrive and even Eliza realizes that she is capable of acting against her deeply held beliefs. 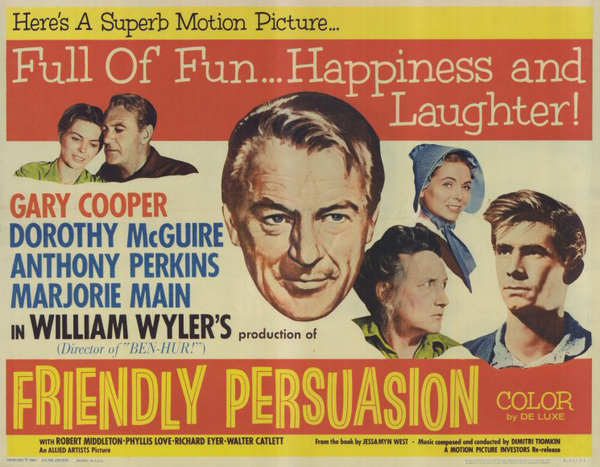 At first, I kinda had my doubts about how much I’d like Friendly Persuasion because even with my history of having good second choices, I had really wanted to see One Sunday Afternoon. But it didn’t take long for Friendly Persuasion to start winning me over. I loved everything about it. The writing by Michael Wilson and direction by William Wyler were both excellent. Although Dorothy McGuire and Gary Cooper were also both excellent, Anthony Perkins really steals the show here; this was one of the best performances I’ve ever seen by him. Since Perkins is so famous for playing Norman Bates, a deranged murderer, in Psycho, it’s really interesting to see him play a character (beautifully at that) on the opposite end of the spectrum and is extremely reluctant to resort to violence. The movie is so wonderfully sensitive and the characters so intriguing, Friendly Persuasion is the kind of movie I could easily watch over and over again. Loved every minute of it. The Yellow Rolls-Royce follows the journey of a single yellow Rolls-Royce as it changes ownership three times and the role it plays in all their lives. The Rolls-Royce is originally purchased by Charles (Rex Harrison), the Marquess of Frinton as an anniversary gift for his wife Eloise (Jeanne Moreau). It’s their tenth anniversary, so he wants to get her something truly special. Unbeknownst to him, Eloise has been having an affair with another man. Charles is enthusiastic about horse racing and dreams of winning a big title, but when the day of the big race comes and his horse comes in first, Charles’ day is tainted by catching Eloise together with her lover in the brand new Rolls-Royce. He isn’t about to divorce her; it wouldn’t look good. However, he does sell her new car. 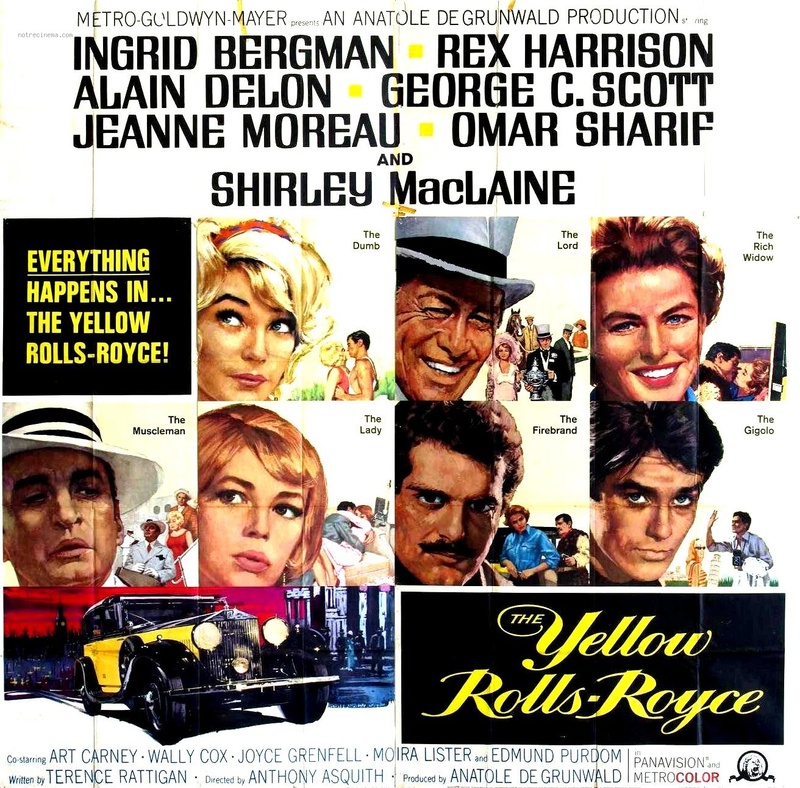 Next, the Rolls-Royce is bought by gangster Paolo Maltese (George C. Scott) as a gift for his girlfriend Mae (Shirley MacLaine), who are on vacation in Italy. Not long after they buy the car, Paolo has to leave to tend to some “business,” so he has his associate Joey (Art Carney) to take her out and keep an eye on her. Mae is bored of Italy, but her trip gets a little more interesting when she meets photographer Stefano (Alain Delon) and falls in love with him. Joey allows their affair to carry on, but when the news of Paolo’s “business trip” (a brutal murder) makes headlines, he feels the need to remind her of who she’d be dealing with if she left. Although she loves Stefano dearly, she reluctantly decides to leave with Paolo. The third owner of the Rolls-Royce is Gerda Millett (Ingrid Bergman), a wealthy American woman taking a trip in Europe, who decides to buy the car on a whim. She meets Davich (Omar Sharif), who is looking to get back into Yugoslavia, to avoid a Nazi attack. She reluctantly agrees and isn’t happy about being involved, until she realizes just how serious the situation is. After getting a taste of what the Nazis are capable of, Gerda becomes active in smuggling people to safety. She works very closely with Davich and the two begin to fall in love, but they realize they can do more good for the cause by working apart than they can together. Posted in 1960s, Blogging Under the Stars, Dramas and tagged Alain Delon, Art Carney, George C. Scott, Ingrid Bergman, Jeanne Moreau, Omar Sharif, Rex Harrison, Shirley MacLaine on August 30, 2015 by Angela. Alex and Katharine Joyce (George Sanders and Ingrid Bergman) have been married for several years, but their marriage isn’t necessarily a happy one. There’s no romance in their relationship and when they think about it, they don’t really know each other at all. When they make a trip to Naples together to sell a villa that belonged to Alex’s late uncle, the drive is the longest time they’ve spent alone together in their marriage. Once they arrive in Naples, it becomes clear just how unhappy and distant they are with each other. Katharine prefers to take day long trips to museums and taking in the historic locations while Alex prefers to spend his time in Capri flirting with other women. All of the images of death Katharine sees really resonate with her and all the pregnant women she sees around town make her long for a child of her own. Eventually, Alex and Katharine reach a breaking point and decide to divorce. But is it really too late for them? Journey to Italy is a movie that’s best to actually watch and experience than it is to write about or read about. 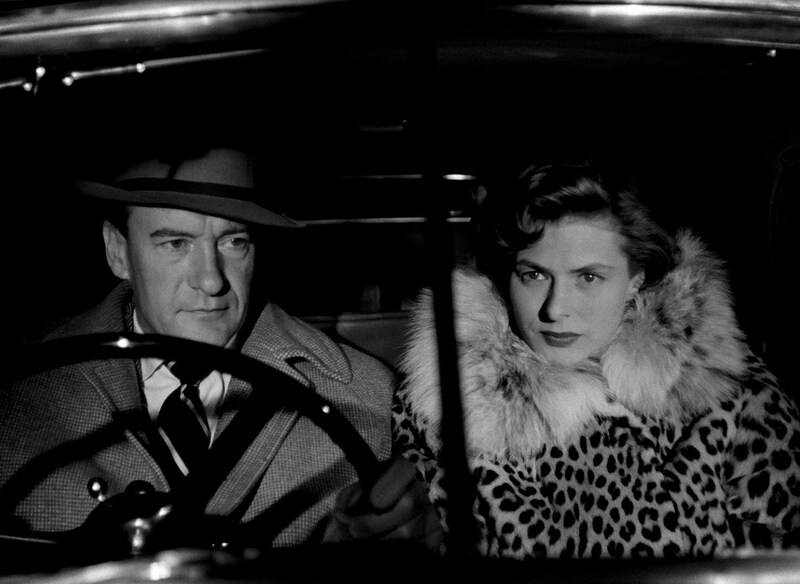 It’s a beautiful, haunting film with exquisite performances by Ingrid Bergman and George Sanders. They were absolutely believable as a terribly unhappy, distant couple. It’s all beautifully filmed and very nuanced; very intimate. It’s one of those types of movies that might not seem like it’s going anywhere, which can be frustrating for many people, but it all absolutely does lead somewhere. Posted in 1950s, Blogging Under the Stars, Dramas, Foreign and tagged George Sanders, Ingrid Bergman, Roberto Rossellini on August 29, 2015 by Angela. When J. Spencer Halford (Theodor von Eltz), a business man known for his shady dealings that have swindled lots of people out of their money, is found murdered in his car, it’s exactly the kind of story local newspaper reporter Steve Grey (Spencer Tracy) is best at handling. His reputation for writing about murder cases has earned him the nickname of “The Murder Man.” At least, this would be the perfect story for Steve, if his other coworkers could find him; he also has a reputation for being a hard drinker who often wakes up in places that aren’t his home. When he’s found and gets to work, he comes up with a theory that Halford was killed by a shot fired from the shooting gallery across the street and that Halford’s business partner Henry Mander (Harvey Stevens) killed him to collect on his insurance policy. Enough evidence is found to support that theory, Mander is put on trial, and Steve is one witness to testify against him. His testimony is enough for him to be found guilty and Mander is sentenced to death. Although this should be a victory for Steve, he feels awful about it. His boss and his girlfriend Mary (Virginia Bruce), the newspaper’s advice columnist, both convince him to take a vacation, but that doesn’t do much good. Just before Mander is set to be executed, Steve’s fellow reporter Shorty (James Stewart) convinces him to do the final jailhouse interview with Mander. It should be an explosive story, but after meeting with Mander, Steve can’t write the story. He knows Mander is innocent and knows who really killed him and must tell the truth before it’s too late. The Murder Man is an absolute gem. A very tightly-told crime story with a great twist at the end. I usually find most plot twists to be rather predictable, but I liked this one. It’s also noteworthy for being a major film milestone for two film legends — Spencer Tracy and Jimmy Stewart. This was the first movie Spencer Tracy made while under contract to MGM; he went on to work for the studio for 20 more years. He certainly made the most of his MGM debut, he was great in it. 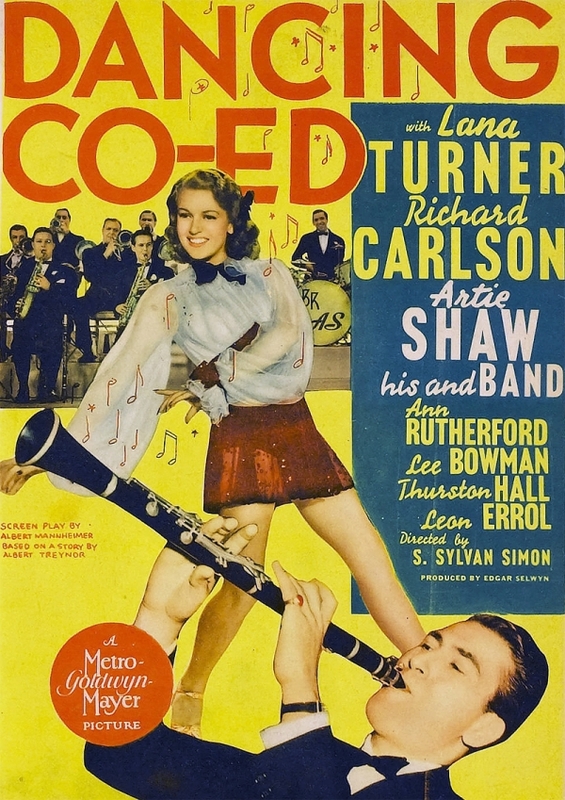 This is also the first featured, credited film role for Jimmy Stewart. Since it’s an extremely early role for him, he’s not given a whole lot to do, but it’s still just fun to see Jimmy Stewart in his first featured role. Virginia Bruce rounds out a great cast as the sympathetic, likable girlfriend. I’m not sure why I’ve never heard of it before today, but I sure am glad I decided to watch it. As much as I find it ridiculous that a real reporter would have this much power over a murder investigation, these types of 1930s newspaper movies sure are entertaining. 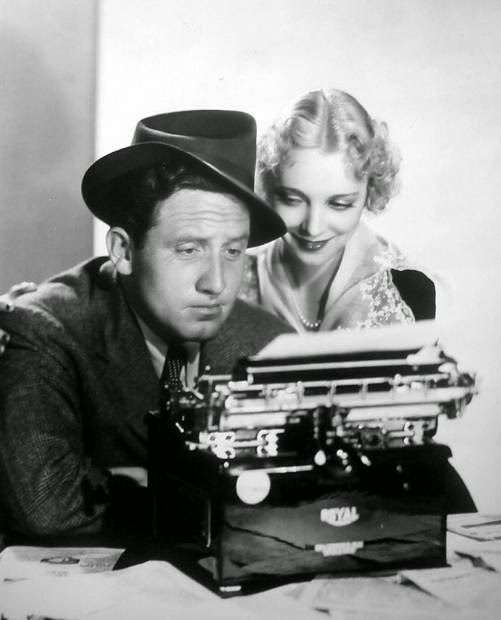 Posted in 1930s, Blogging Under the Stars, Courtroom Dramas, Crime Film and tagged James Stewart, Spencer Tracy, Virginia Bruce on August 26, 2015 by Angela. Jack Diamond (Ray Danton) gets his start in the criminal world as a small-time crook in New York. He wants to start dating dance instructor Alice Scott (Karen Steele), but when she turns him down, he sabotages her intended dancing partner so she’ll choose him instead and when they’re in the middle of a dance competition together, he sabotages their top competition to win. Later that night, while he’s at a movie with Alice, he sneaks out and robs a jewelry store. But he has his eyes set on bigger and better things. Working with his ailing brother Eddie (Warren Oates), he decides he wants to get ahead by stealing from criminals because he knows they can’t call the cops on him. Not wanting to start small, Jack decides to go after the notorious Arnold Rothstein (Robert Lowery) by trying to get a job working as his bodyguard so he’ll have access to all his tricks of the trade. Of course, Arnold Rothstein is not an easy man to get close to and Jack has to resort to buying thousands of dollars worth of clothes and charging it to Rothstein, knowing he’ll send some of his men to bring him to Rothstein to explain. Rothstein is impressed, but not enough to hire him — not yet anyway. But he does get there eventually and he begins to think he’s invincible. It isn’t long before Jack plans to kill Rothstein and takes over his crime syndicate. He runs the syndicate with ruthless abandon, his yearning for power never satiated. But sooner or later, Jack learns the hard way that what must come up must come down when even his closest henchmen and Alice, now his wife, can’t deal with him anymore. 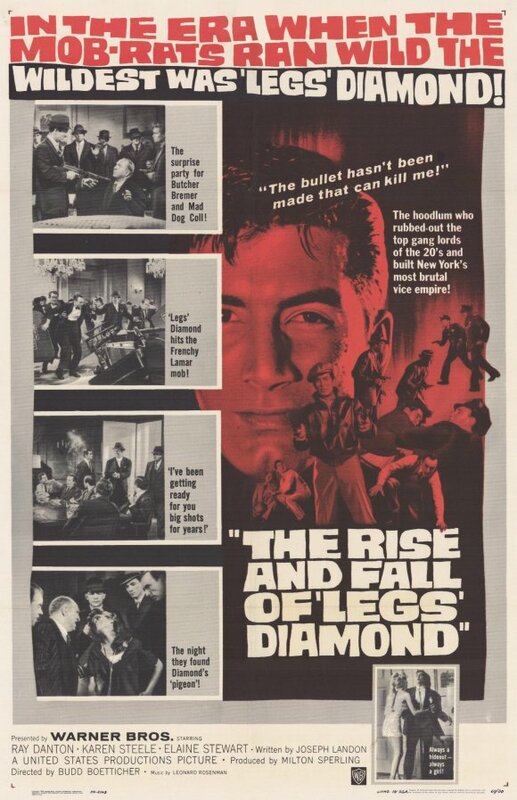 I love a good gangster movie, so The Rise and Fall of Legs Diamond was naturally a hit with me. I don’t know much about the life of Legs Diamond, so I have absolutely no idea how historically accurate it is, but it was at least entertaining. I don’t know that I’ve ever seen a Ray Danton movie before, but I was very impressed by his performance as Legs Diamond. I’m not sure why it isn’t better remembered as one of the all-time great gangster performances in film, but he was really fantastic. The movie, as a whole, may not be one of the all-time best gangster flicks, but it’s still a very entertaining movie. Absolutely worth seeing for Ray Danton and Lucien Ballard’s great cinematography. Posted in 1960s, Blogging Under the Stars, Gangster and tagged Karen Steele, Ray Danton, Robert Lowery, Warren Oates on August 25, 2015 by Angela.